Comedy Dynamics will release Howie Mandel presents Howie Mandel at the Howie Mandel Comedy Club via the Comedy Dynamics network on iTunes, Google Play, Amazon, Dish, DirecTV, Comcast and more on April 23, 2019. The album will be released April 26 2019 on iTunes, Google Play, Spotify and more. 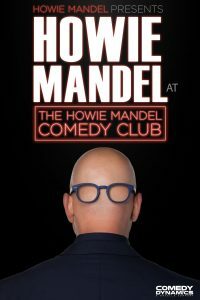 Howie Mandel presents Howie Mandel at The Howie Mandel Comedy Clubmarks his first solo stand-up special in 20 years. Mandel’s buoyant presence embraces the old and welcomes the new with his return to the comedy special arena at the club that bears his name. Directed by Brian Volk-Weiss and filmed at Howie Mandel’s Comedy Club in Atlantic City, Mandel exercises his mastery of making the mundane hilarious as he tells tales about his 40-year marriage, life and career. Mandel has reached legendary, multi-hyphenate status in show business, covering nearly all aspects of the entertainment spectrum in his 40-year career as an actor, voice artist, author, host and producer. He serves as host and executive producer of Deal Or No Deal, a role for which he received an Emmy Award nomination for Outstanding Host for a Reality or Reality-Competition Program. For the past nine seasons, Mandel has served as a judge on America’s Got Talent,which will return for its 14thseason this summer. He is also a mainstay on the comedy scene, performing as many as 200 stand-up comedy shows each year throughout the U.S. and Canada. “Howie is more than just talented. He’s a brilliant writer, producer and comedian who has proven over the years he can truly do it all. It’s a pleasure to be working with such an iconic name in our industry.” said Brian Volk-Weiss, CEO of Comedy Dynamics.